Published: Jan. 5, 2019 at 07:22 p.m.
Houston Texans quarterback Deshaun Watson gets loose for a 21-yard run on fourth-down. 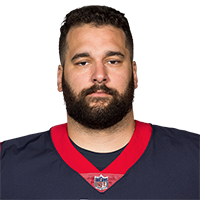 Published: Jan. 5, 2019 at 05:26 p.m.
Houston Texans defensive end tips a pass from Indianapolis Colts quarterback Andrew Luck, and nose tackle Brandon Dunn snags the interception. Published: Dec. 30, 2018 at 03:22 p.m.
Houston Texans wide receiver DeAndre Hopkins beats Jacksonville Jaguars cornerback Jalen Ramsey to bring down a 43-yard pass from quarterback Deshaun Watson. Published: Dec. 30, 2018 at 03:08 p.m.
Houston Texans running back Lamar Miller bulldozed his way into the end zone for a 7-yard touchdown.